The Education Policy Fellowship Program is a 10-month in-service professional development program for emerging and mid-level leaders. These professionals work in public, non-profit, and private sector organizations, but they all share the same professional passion: education. In 2014 the Cooperating School Districts of Greater Kansas City and the Local Investment Commission revived the Missouri-Kansas chapter to broaden the understanding and perspective of area educators and others working with children and families. EPFP is now taking applications for the 2019-2020 program. Download the booklet for more information. 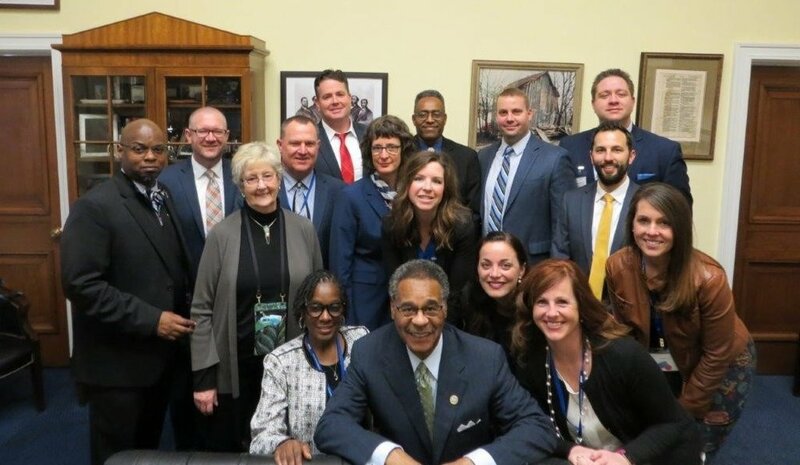 Members of the 2017-2018 EPFP class met with U.S. Rep. Emanuel Cleaver II during their visit to the nation's capitol for the Washington Policy Seminar. 2016-2017 EPFP fellows at the Harry S. Truman Presidential Library and Museum. 2015-2016 EPFP fellows with U.S. Congressman Emanuel Cleaver II. 2014-2015 EPFP fellows at the U.S. Capitol. Torree Pederson, President of the Alliance for Childhood Education, and Tim Decker, former EPFP alumni and Director of the Missouri Children's Division, speak about their experience with the Education Policy Fellowship Program (EPFP). Dr. Bob Bartman, director of the Education Policy Fellowship Program EPFP, presents at the May 18, 2015 LINC Commission Meeting. The new Kansas City regional EPFP program will be led by Dr. Bob Bartman, recently retired superintendent of the Center School District and the former Commissioner of Education for the Missouri Dept. of Elementary and Secondary Education. Bartman was named a Pioneers in Education in 2014 for his commitment and contributions to public education in Missouri. Email for more details or call (816) 410 8350. Click cover to download info on the 2019-2020 EPFP program. Please use our Squareup store to make your EPFP Cohort program fee payment.